- Prayer saved my life! SET FREE: Rune Storaas (49) from Utne has for half of his life been addicted to alcohol, but in 2005 he was set free after being prayed for by Svein-Magne Pedersen. 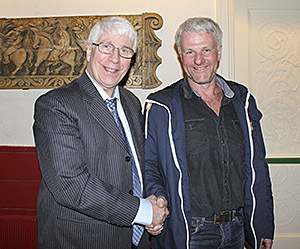 When Pedersen had meetings in Odda in April this year, Rune was finally able to thank him for what had happened. - You probably saved my life, he says happily. For over 20 years, Rune Storaas (49) from Utne was bound by alcohol, which led to his life falling apart. In October 2005 something happened regardless that changed his life. Rune Storaas grew up in Utne, Hardanger. In his late teens he began trying alcohol, which many of his friends also did. Unfortunately the drinking got out of hand and the alcohol took over. -As the years went by the alcohol intake increased to larger amounts. Often I drank several days in one stretch, and I could drink four to five bottles of liquor a day, he said. During his time as an alcoholic, he had married and had three children, but the marriage ended after 18 years. His wife and kids had had enough, and left him. At the same time he also lost his drivers license, which had ramifications for his job. Rune worked in the transportation industry, and it all caused him losing his job. -When the family moved out, I was very depressed. I sat in a chair and began drinking. In one month I consumed 200 liters of cider. After some time Rune tried a detoxification clinic. It helped for a for some time, but after a while he was back to the old ways. He now began to understand the gravity of the situation. A few months later he had an errand in Bergen. When he called his mother, she told him that Svein-Magne Pedersen was going to have a meeting in Loddefjord church on the weekend of October 2005. Rune decided to go, but spent the days in advance drinking up most of the alcohol he had. -I thought I had nothing to lose. I had tried everything and was out of ideas. Perhaps intercession could help me? When Saturday came Rune made the trip to Loddefjord. The church was crowded with nearly a thousand people attending. Pedersen had just been on national TV, and the attention before the meeting was great. -During the meeting, I got cold feet and stepped out. I felt that my body needed more alcohol. On the outside steps I met an elderly man. I asked him if he thought I should go back inside to get intercession. Fortunately the man repied with a yes, and I listened to his advice. Rune eventually talked to the organizers who made sure that he got to be the first in the prayer queue. -When Pedersen prayed for me, I bowed my knee. I felt nothing in particular, but left the meeting with a good feeling. Despite intercession, Rune still felt a bit of craving for alcohol. After two weeks there was another round of alcohol. Then something happened that would be life-changing. -I had been drinking something, and was asleep in bed. Suddenly I heard a sound in the room that I awoke from. I could not breathe. It felt like I was lifted up from the bed. I was scared, but did not manage to make a sound. In my mind I cried out for help. Suddenly it let go and everything was quiet. After that night, I never drunk alcohol. I was completely set free. In the time that followed, Rune went back to work. He runs a farm and works as a truck driver. He has a good relationship with his children. At times he goes to schools and gives lectures on the dangers of alcohol. He dreams about a future of working with alcoholics. -When I travel around, many ask how I was set free. Then I tell about Pedersen's prayer. I am convinced that that was what helped me. It probably saved my life, and I'm so grateful, Rune says happily.